Ex Military vehicles, Ex. Army Mod Sales and Nato plant and equipment for sale and export » L.Jackson & Co. Ltd.
We can provide a comprehensive worldwide freight forwarding service. We can apply for and obtain any export licence dependent on restrictions and approval. 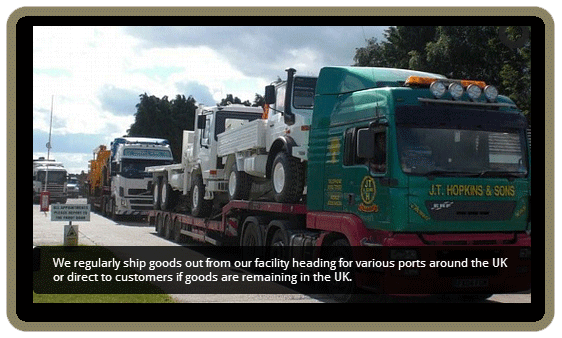 We are regularly importing and exporting vehicles in and out of the UK not to mention our operations within Europe. We use a variety of different International shipping lines and transport companies so that we can obtain the most competitive rates available. We can also offer full loading and off loading facilities at our Misson depot. Loads from 500kg to 45,000kg can be handled with ease. Also our purpose built loading ramp has saved considerable time when turning loads around quickly. Generally shipments go by road to UK ports including Tilbury, Felixstow, Immingham and Southampton but occasionally when time is a critical factor goods are air freighted out from the local airport (Robin Hood). A recent example was the movement of several Hagglunds machines to Australia.